Seeking a personable, creative individual who enjoys helping customers, interior design and art. From designing picture framing projects to execution, the ideal candidate is just as comfortable working with people as they are working with hand tools. Picture framing experience is a plus, but not required. We will train the ideal candidate in the art of picture framing. Retail experience preferred. Potential for management. I know I made the right choice coming to Frame Unlimited as I have in the past. The staff was excellent, skilled, friendly and a great team! They were all equally excited to have the opportunity to work on something…The finished product was phenomenal and did it justice which is what I know [Frames Unlimited] was striving for and succeeded in doing…I had come to Frames Unlimited in years past and will always refer anyone needing framing…Thank you for having such a great and skilled staff! Frames Unlimited offers such an array of moldings, that you can definitely find something to fit your budget…Each framer is so knowledgable, talented, and willing to help. The service is remarkable…I have been recommending Frame Unlimied for years. Each and every piece I have had framed is impeccable. Frames Unlimited in Westlake is second to non! You are in for a treat! 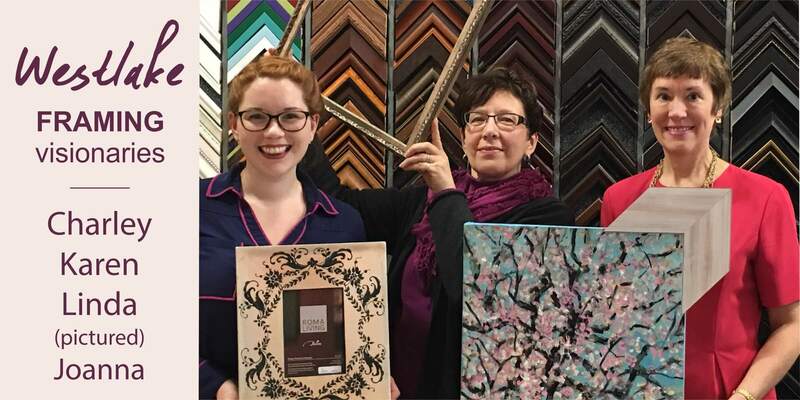 It was my lucky day when I walked into Frames Unlimited in Westlake, Ohio!…I’ve been hooked every since. [Frames Unlimited] was able to envision my style and the type of artwork I was looking for….I can’t say enough good things…The work, time frame and knowledge is outstanding. I have and would recommend them to everyone.